The Crayola colors of rainbow chard brighten farm market stands at this time of the year, their brilliant purples, reds, yellows, pinks, oranges flooding stems and veining the large, crinkled leaves. In the garden rainbow chard Bright Lights is a show stopper, seeming to delight in attracting attention with its candy colors. Stalks and leaves easily top out out at three-plus feet. Chard loves cool temperatures and in June, when the heat of the summer smiles on tomatoes and peppers, it takes a well-deserved break from production in the lead-up to a big come back in the fall, when it shows off again. A real workhorse of a garden vegetable, chard also is rich in iron and calcium and boasts a mild, buttery flavor and more pliant texture than other hardy greens like kale and collards. 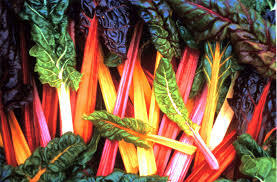 No wonder chard has become such a popular item at CSAs and farmers’ markets. Showcasing our theme of the month “Colors of Spring,” here’s another terrific way to fix this tasty green vegetable. Danielle demoed this for our April 2015 selection of recipes. Heat the olive oil in a large deep pot, large enough to hold all of the greens. Add the garlic and pepper flakes and sauté a minute until the garlic is fragrant. Add the chopped tomato and capers, cook for 2 minutes. Add the greens, handfuls at a time and cover the pot with a lid to steam the greens. Cook until the greens are all wilted but have not completely changed color, about 2 minutes. 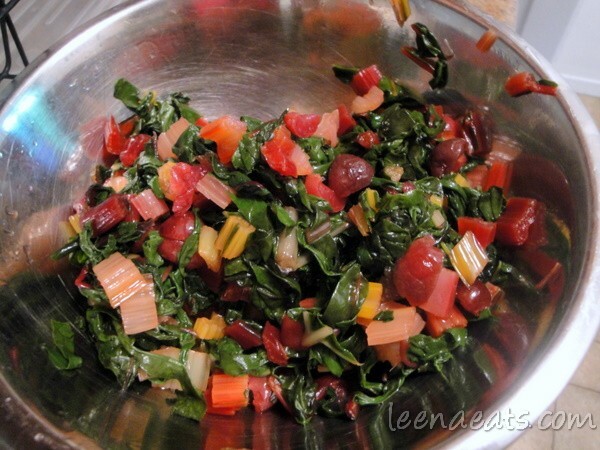 (The acidity of the tomato will cause the greens to lose their vibrant color if overcooked.) Just before serving, add the chopped fresh basil and season with salt and pepper. Serve with grated Parmesan on the side, if desired. Serves 4-6. This entry was posted in Recipes from Danielle's pantry, Sides and tagged basil, capers, chard, tomatoes. Bookmark the permalink.